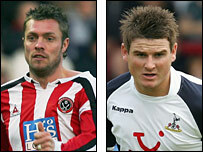 Leicester have signed Geoff Horsfield, Mark Yeates and Luigi Glombard on loan. Veteran striker Horsfield, 33, joins from Sheffield United while forward Yeates, 22, signs from Tottenham - both until the end of the season. Cardiff City winger Glombard joins subject to Football League paperwork on an initial one-month deal and should be able to play against Luton on Saturday. Foxes boss Rob Kelly said of French forward Glombard: "Luigi has decent pace and likes to get at people." Kelly added: "He can play across the front positions but we see him operating as a winger for us. "We have been after Geoff for a while but have not had the finances to do the deal. "Mark is a talented young player. He can play on either side and gives us something different to what we've got." The triple signing follows the departure of Gareth Williams to Watford earlier on Wednesday's transfer deadline.